Hi Deborah, this is one of my favorites by Chanel. Beautiful reuse of the bottle. Pretty rose. Happy weekend hugs sent to you. 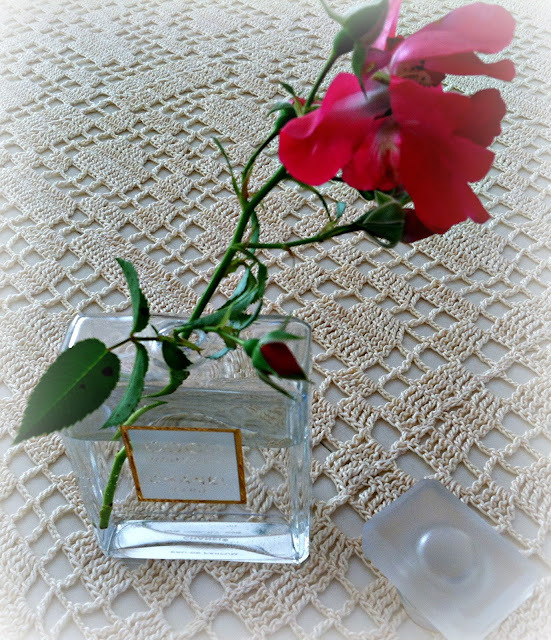 I love the idea of empty perfume bottles for bud vases, simple but effective. Thank you for sharing and have a wonderful weekend. You are a genius, sweet friend. The perfeum bottle and rose together are extra romantic and enchanting. Happy October, dear Deborah. Hugs and much love! What a clever idea! I'm all about quick and easy DYI projects too! This is so lovely, Deborah. Coco would approve. I can't wait to try it. How clever you are. I've kept some of my most favourite bottles too and made them into a little collection. Have used some as bud vases, but haven't done that for a long while. Your post reminded me. Yes, that makes for adorable little vases. Great way to recycle! I save all of my perfume bottle, just because they are so pretty. They are hidden away so I don't get accused of being a hoarder! But this would give me a very good reason for taking them out of storage! Oh yes , I love this idea and have a few precious perfume and cologne bottles I haven't been able to throw away. A vignette of little perfume bottles each bearing a single bloom , lovely ! I have trouble throwing away a perfume bottle but never thought of trying to pull out the stopper. Good idea! 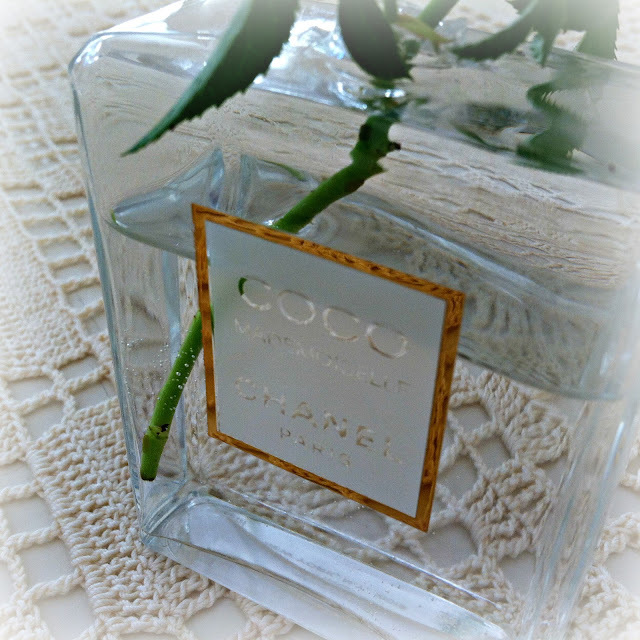 I like this because I used to wear Coco and love the scent. Angel is very nice too. I worked in close quarters with a lady who wore it, and never got tired of the scent. Good idea and very chic. Oh Deborah, you have captured my attention with this idea. You are incredibly resources. I love my Chanel Parfums too and I always hate to throw the pretty bottles away. I love love love this and I am definitely doing this with mine.